Violet May was a pivotal figure in the development of the music scene in Sheffield and the redoubtable owner of the city's most famous record shop. 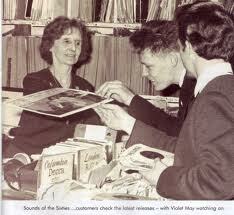 “Violet May was a pivotal figure in the development of the music scene in Sheffield. Not only in what people bought in terms of records for their listening pleasure but in how that music influenced countless musicians as well. Without her I’m sure that I wouldn’t be making music today, although I never had the pleasure of meeting her but my father did and some of the music he bought in her shop still informs many of my ideas to this day. She widened the sonic palette of thousands of people from Sheffield and other places in Britain as you will see in the pages of this book. In this age of instant access to virtually any recordings at the touch of a button it is hard to imagine a time when you could spend months, often years, tracking down a rare record by an obscure artist you may have heard only snippets of their music, or had a cursory and rather vague knowledge of, but it really was like that and Violet May was a light in the darkness for the avid record collector and the developing musician. How she got those records is still a mystery to me and this book, written by my good friends “Gaspin” Gus Chapman and John Firminger, at last sheds some light on that closely guarded information. My Father found records by Howlin Wolf, Muddy Waters, Little Walter, The Dell Vikings and many, many more which at the time were virtually impossible to find over here, and the effect they had on a young enquiring mind was like a cerebral atom bomb. I still have those records my father left to me and I for one would like to thank Violet for them and the stories I keep with me always, along with her effect on the broadening of her customers musical horizons which is incalculable, although as a hard business woman I doubt she ever knew. 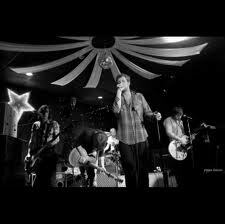 The band's name was taken from a highly respected independent record store in Sheffield in the 1970s called Violet May. A book documenting the store called Shades of Violet has been written by John Firminger and Gus Chapman and features an introduction by Sheffield singer-songwriter Richard Hawley, formerly of Sheffield actslongpigs and Pulp (band).